O: laur hd of Apollo r, dotted border. R: [BΑΣΙΛΕΩΣ] on r and ANTIOXOY on l., Apollo stg l., testing arrow and resting l. hand on grounded bow. ΔΕ/Λ Primary control outer l., above. Ι(long serifs) secondary control outer l., below. أهلا وسهلا, Bienvenue, Willkommen,καλώς ορίσατε, Benvenuto,Bem-vindo,Bienvenido,Vítejte, hoşgeldiniz, ברוך הבא ,欢迎 , Witamy....WELCOME! If you are looking for something specific and cannot locate it directly via Google or other engines, please use the search box below. 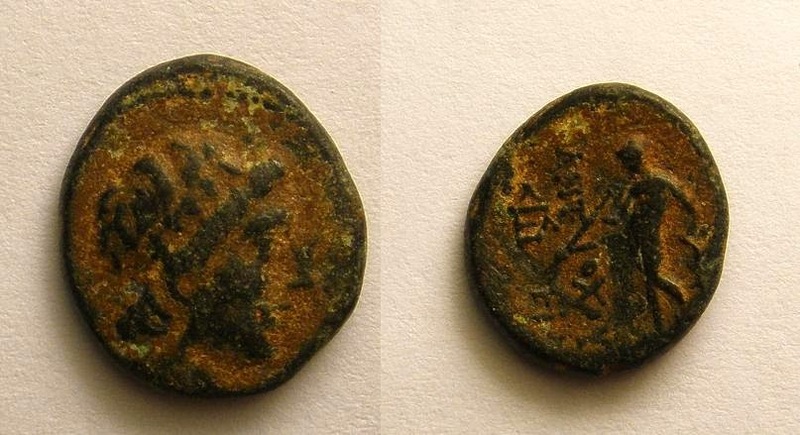 For example if you are seeking a coin of Maximian or Antiochus XI, just input the search term and you will be provided with the results herein. New coins are added frequently and therefore, if you do not find something you are seeking for reference, you may do so later. So visit often. Further, if you are interested in the sources list for the information provided in this blog, please go to the search box and input skelter which should take you directly to the "Introduction and Sources" page. Also, if you are interested in seeing a listing of the Institutional Visitors to this site, please go to the end of the Intro and Sources page.